I use Red-Gate's tool that is similar to this and it is very handy, so I am quite interested to see how this tool will work. I'm not sure if I need to set something up or what, but there are a few things that don't seem to work for me. 1. When I type a keyword the list of objects shows but the list shows all objects for the entire server. I have to type the db name and owner to get the table that I want. Can SQL assistant use the database that I am connected to in that window and show me the tables/objects for that db? 2. I tried using the snippets by typing the short name such as sg and then the hot key but nothing happens. 3. I have it set to capitilze my keywords but that doesn't seem to happen. I have tried in both SQL 2000 Query Analyzer and 2005 Mngmt Suite. You used CTRL+SPACE right? or some other key? Which key is currently selected for "sg" snippet? I am afraid something is wrong with the setup. We will look into this and get back to you. The snippet issue appears to be an issue with the MS Management Studio. It intercepts the default hot key before SQL Assistant can see it. We will have a fix available by Monday next week. As for the keywors conversion, we ae unable to reproduce it. Is that feature enabled in the Options? Which conversion type is currently selected? I have the same issue. I'm the DBA so I have SysAdmin privs. I use SQL Mgt Studio and created a new query connected to the server using windows auth, changed the Database Dropdown to WARD yet I do not get WARD tables at the top. I get other tables. I took a screenshot but cannot seem to add an image to the post. 2 qucik questions: wich version of Mgt Studio are you running? Is this an issue isolated to the Mgt Studio or you get same behavior in SQL Query Analyzer and/or other editors? I tried this in query analyze and it seems to work fine. I am using Sql Mgt Studio Version 9.00.2047 and after downloading the newest version it seems to bring the tables in the database I'm working in first. Was a fix put out for the problem of no context menus in MS SQL Server Management Studio Express? However, when I type a SELECT statement or anything else, nothing... The keywords get capitalized but no context menus come out for the tables or fields. I am using SQL Assistant 1.0.47 Beta... Any help would be appreciated. Great product that works well with everything else! I just tried that and it works fine for me. I am going to talk to developers and ask for help. 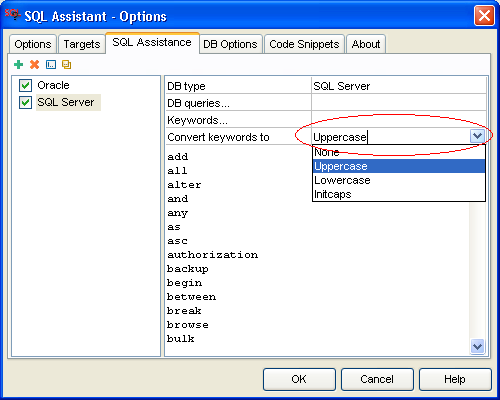 Just by any chance, you didn't customize the original queries in SQL Assistant options, especially the "Objects" query? Does anybody else experience this behavior in MS SQL Management Console? No, I did not customize any of the queries... I just tried SQL Assistant 1.0.52 with the same results... No context menus for tables. Thanks for your effort! Please try the following: In SQL Assistant Options click DB Options tab; in the DB Queries list locate Objects (MSSQL) and click it; select all text in the query pane and paste it to the MS Management Studio query editor. Replace the question mark in the pasted text with user_id()and run the query. Does it return your table list?